3-Tasman William Walker was born on 24 Jun 1888 in Spring Rises, Exton, died on 22 Feb 1956 in Corona, Westwood at age 67, and was buried in Feb 1956 in Uniting Church Cemetery, Hagley, Tasmania. Tasman married Emma Jane Pinkard, daughter of Walter Pinkard and Mary Sturgess, on 22 Apr 1914 in Westbury, Tasmania. Emma was born on 13 Nov 1888 in Longford, Tasmania, died on 9 Oct 1925 at age 36, and was buried in Oct 1925 in Uniting Church Cemetery, Hagley, Tasmania. 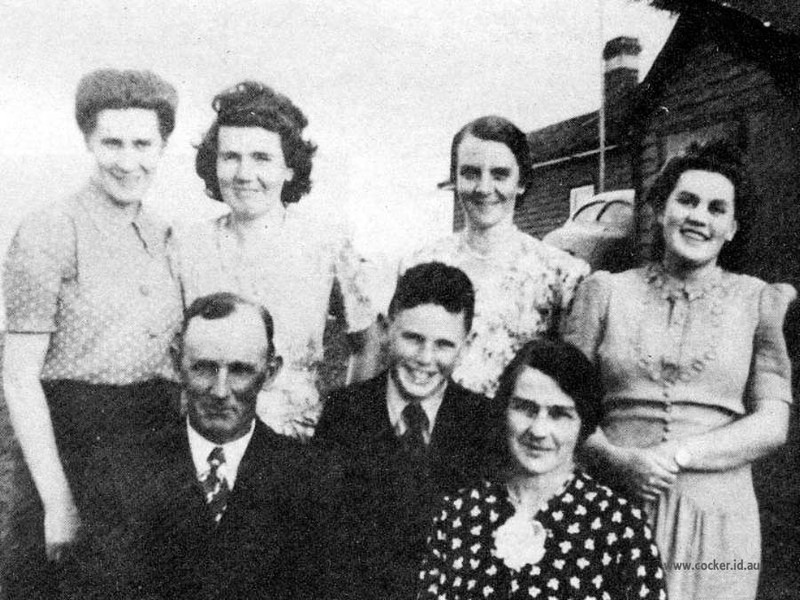 4-Winifred Mary Walker was born on 13 Apr 1915 in Ivy Bank, Deloraine. Winifred married Colin Thomas. Colin was born on 3 Jan 1910. 4-Jean Rebecca Walker was born on 13 Mar 1917 in Gleadow Street, Deloraine, died on 14 Jun 2005 in the Launceston General Hospital at age 88, and was buried on 17 Jun 2005 in Uniting Church Cemetery, Hagley, Tasmania. Jean married Lawrence Steward Heazlewood, son of Bernard Heazlewood and Linda Isabel Trethewie. Lawrence was born on 4 Dec 1915 in Deloraine, Tasmania. 4-Kathleen Alice Walker was born on 20 Feb 1923 and died on 7 Jul 2007 in Seven Mile Beach at age 84. Kathleen married Colin Diprose, son of Bennie Owen Diprose and Evelyne May Edwards. 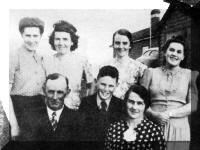 Colin was born on 23 Jul 1917 in Nurse Reynolds Hospital, Wynyard. They had two children: Susan Helen and Fran. 4-Gwenneth Minnie Walker was born on 22 Sep 1925. Gwenneth married Kingsley Evans, son of Andrew Evans and Mary Elizabeth Johnston. Kingsley was born on 24 Aug 1918 in Queen Victoria Maternity Hospital, Launceston. They had two children: Christine and Andrew. 5-Christine Evans was born on 19 Aug 1953. Christine married John Tempest. John was born on 23 Apr 1954. They had three children: Nicole, Gareth and Michael John. 6-Nicole Tempest was born on 10 Jun 1979. 6-Gareth Tempest was born on 19 Feb 1981. 6-Michael John Tempest was born on 2 Dec 1986. 5-Andrew Evans was born on 11 Aug 1955. 4-Bruce Edwin Walker was born on 7 Sep 1932. Bruce married Hazel Geraldine Jordan in Westwood. Hazel was born on 21 Dec 1932, died on 29 May 1999 at age 66, and was buried in May 1999 in Uniting Church Cemetery, Hagley, Tasmania. They had two children: Peter Bruce and Jennifer Louise. 5-Peter Bruce Walker was born on 26 Dec 1956. 5-Jennifer Louise Walker was born on 17 May 1959. Jennifer married Stephen Eeles. Stephen was born on 14 Dec 1955. They had two children: Amanda Louise and Philippa Kate. 6-Amanda Louise Eeles was born on 21 Nov 1985. 6-Philippa Kate Eeles was born on 12 Sep 1988.